Major trends such as consumerization and bring-your-own-device have started a mobility revolution, as you seek to bring the functionality and real-time data benefits of consumer devices into the workplace. However, to take full advantage of workforce mobility, you need something much smarter than the smartphone in your pocket. Android is a great starting point. It’s found in four out of five consumer handhelds, so it’s already familiar to your workforce. Additionally, we’ve built-in Mx Technology that uniquely strengthens its security to enterprise levels, and developed Zebra Mobility DNA – a comprehensive suite of workforce apps to meet industry needs. Add Zebra hardware purpose-built for working evironments, and you have a definitive way forward. devices into the workplace. However, to take full advantage of workforce mobility, you need something much smarter than the smartphone in your pocket. Android is a great starting point. It’s found in four out of five consumer handhelds, so it’s already familiar to your workforce. Additionally, we’ve built-in Mx Technology that uniquely strengthens its security to enterprise levels, and developed Zebra Mobility DNA – a comprehensive suite of workforce apps to meet industry needs. Add Zebra hardware purpose-built for working evironments, and you have a definitive way forward. Maxim Computer Services Ltd can help you take advantage of Zebra for Android to join the revolution the right way and reach new levels of efficiency, productivity and profitability. 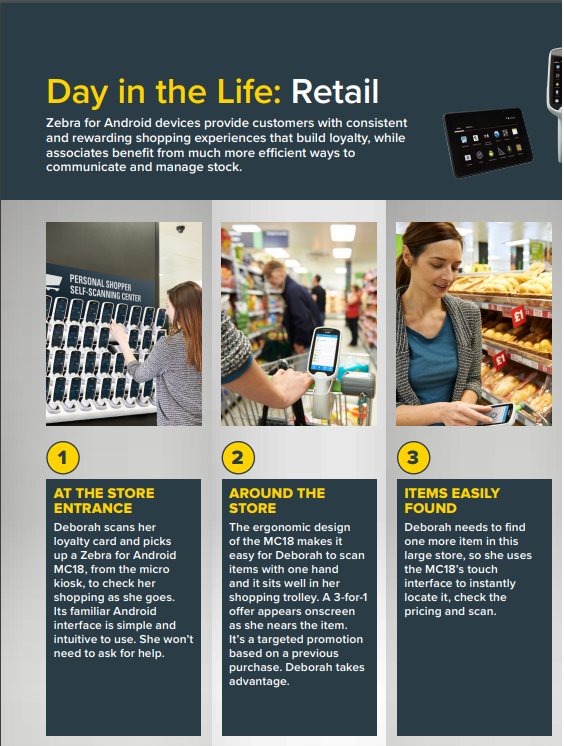 Zebra for Android combines the simplicity of consumer devices with powerful retail tools, making it easy for your staff to conduct price and inventory checks, take mobile payments, scan coupons and communicate across the shop floor and stockroom. Plus, customer devices make self-scan simple and more profitable. 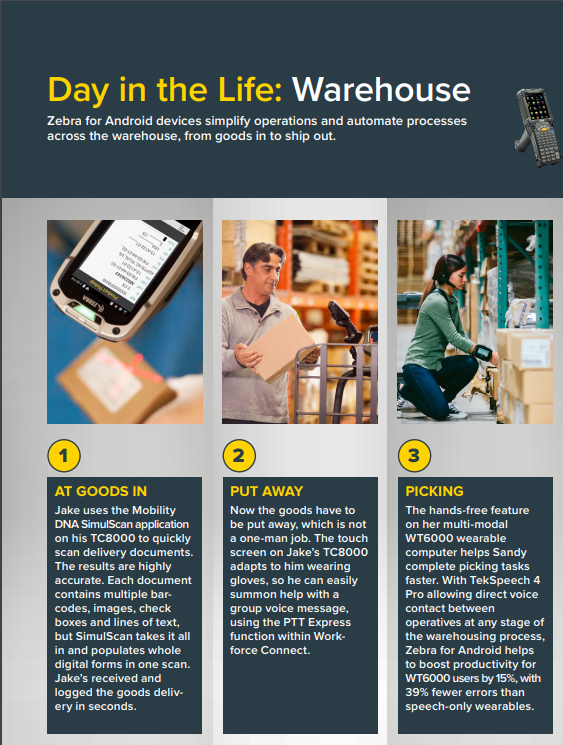 Zebra for Android devices help your workers get more done faster, with features ideally suited to warehouse management, truck unload/load, pick/put away, replenishment, packing and shipping. 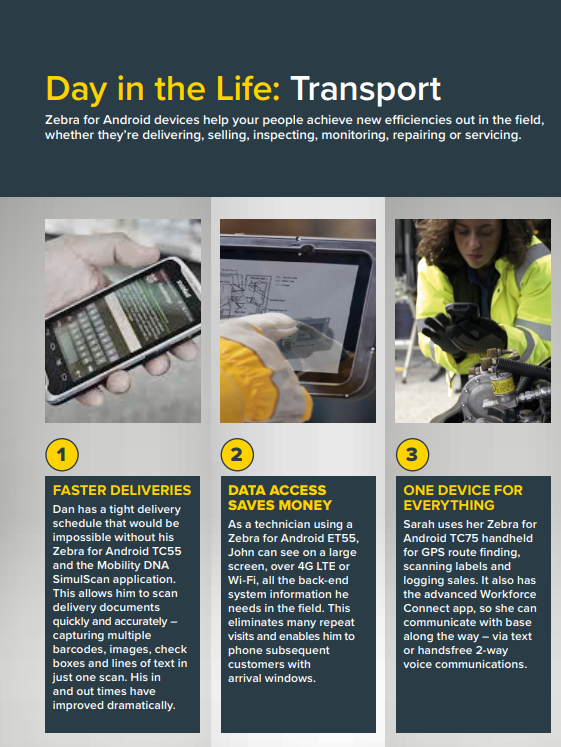 Zebra for Android helps workers carry out everyday tasks more efficiently, such as inventory management, supply line replenishment, maintenance/repair operations and compliance verification. Save time and improve outcomes in clinics. Everything clincians and hospitals need to enhance safety and improve operational efficiency. Zebra for Android healthcare devices are medical grade, with bright touch screens that work even when wet, with a gloved finger. Learn how Zebra for Android increases staff efficiency and customer loyalty. 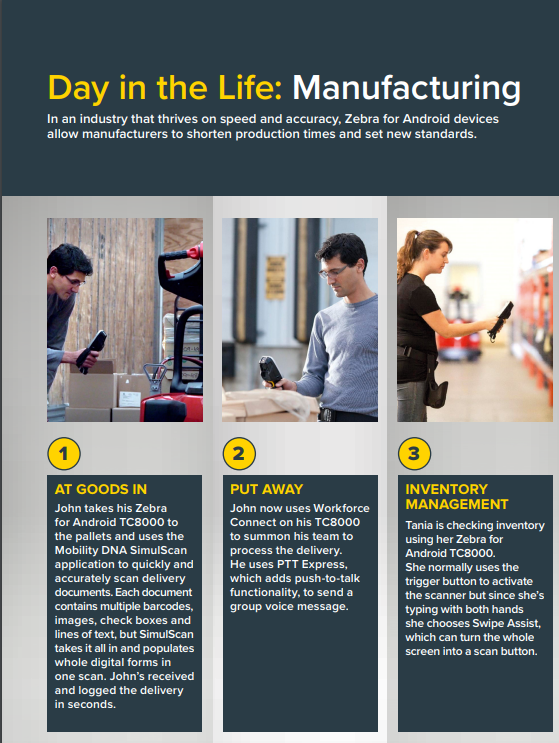 Read how Zebra for Android improves visibility and control for higher productivity. Discover how Zebra for Android simplifies operations and automates processes. See how Zebra for Android increases productivity, reduces defects and improves safety.